MyNetDiary, a comprehensive food diary and calorie counter with online and mobile app services, just announced the release of its new Diabetes Tracker for iPhone. The comprehensive app combines the power of the #1 diet app in the world, MyNetDiary Pro, with state-of-the-art features for tracking blood glucose, insulin, and medications. "Diabetes affects nearly 26 million people in the U.S.," says Sergey Oreshko, CEO of MyNetDiary. "Diabetes educators and medical professionals recommend calculating and recording carbohydrate intake, blood glucose readings, medications, and insulin doses. MyNetDiary now provides easy and comprehensive tracking both in online and mobile formats." The MyNetDiary Diabetes Tracker uses MyNetDiary's top-tier foods database containing over 145,000 unique foods. The database is the only of its kind that searches for results as fast as a user types and provides a built-in barcode scanner for reading food packages. MyNetDiary also records up to 36 different nutrients for each food entered. In addition to calorie and carb counting, exercise tracking and diet planning, the Diabetes Tracker equips users for tracking glucose with multiple target ranges (i.e. pre-meal or post-meal), tracking insulin, blood pressure, LDL and HDL cholesterol, Hemoglobin A1C, and medications. The app also allows users to create custom trackers for anything they or their doctors deem important to monitor, such as quality of sleep, daily steps, or symptoms. The Diabetes Tracker can also classify and categorize data to help identify underlying causes or symptoms through advanced labeling options. "We've been asked by thousands of our members to help them track their battle with diabetes," says Oreshko, "and after a year of work on this, we're pleased to offer the most user-friendly and easy app for tracking everything related to diabetes, diet and exercise, all wrapped into a single iPhone app." Daily and weekly reports and charts are easy to generate and can provide meaningful insight into what works best for a user and how their bodies respond to food, exercise and diabetes treatment. The iPhone app is backed up by MyNetDiary's equally comprehensive online diabetes tracking service, which provides reliable syncing between the app and user's online account. It also provides a platform for integration with other services and secure sharing of information with caregivers. The MyNetDiary Diabetes Tracker is an educational tool and is not intended to diagnose, treat or cure any ailment or disease. If you are seeking medical advice, please visit a medical professional. 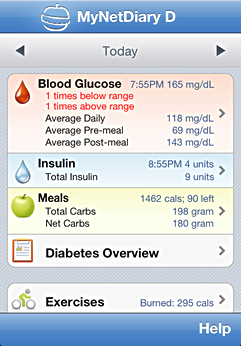 To download MyNetDiary's new Diabetes Tracker for iPhone at the limited introduction price of $3.99, visit the App Store.